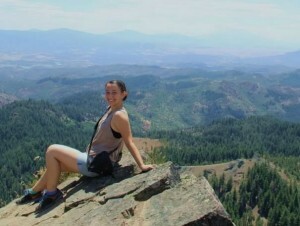 Carmen is a native Oregonian with a passion for the environment. She has worked on a number of environmental causes, including a successful local petition to ban Styrofoam food containers in her area. She is an avid traveler—most recently to Gulu, Uganda—and intends to pursue a career in environmental journalism, whether in print or documentary filmmaking. Growing up with Zoboomafoo gave her a love for animals and a drive to help them in any way possible. Mangatsika! 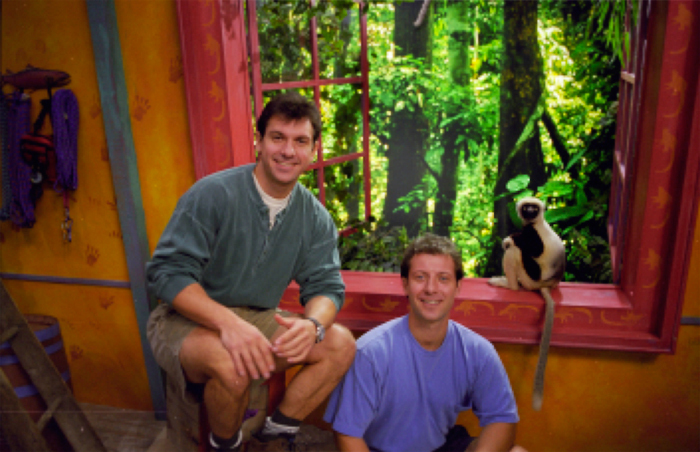 If, like me, you grew up with the irresistibly upbeat theme song of Zoboomafoo, then you probably remember the Kratt Brothers’ infectious energy, the famous overstuffed closet, and of course, the fuzziness and wide eyes of Zoboomafoo the lemur. The Kratts and Jovian in Animal Junction. Photo courtesy of the Duke Lemur Center. Before I get any farther, you should know that Jovian, the lovable lemur who played Zoboo on the show, died on November 10, 2014. It was a tragic day for all who watched Zoboomafoo as children, and I apologize if you didn’t know yet. Jovian, along with occasional appearances with his father, Nigel, starred on the show until its end in 2001. When shooting for the show began waayy back in 1998, Jovian was a lively, friendly sifaka who loved playing, jumping, and mangos. 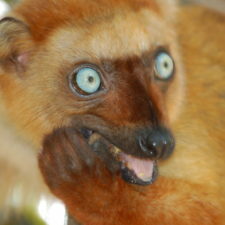 Yes, lemurs have personalities just like people. Don’t believe me? Here’s proof. I mean, seriously? How is something allowed to be this cute?? How are lemurs different from other primates? Lemurs, unlike a lot of animal species, are easily identified by laypeople like you and me. (I’ll spare you the long story about my sophomore Biology teacher giving my class an impromptu 30-minute lecture about the difference between blue jays and scrub jays—they’re both blue birds, but apparently blue jays don’t go farther west than the Rockies). All lemurs have a toothcomb. A toothcomb is the name given to the bottom four middle teeth, which after millions of years in isolated evolution, have fused to become one wide tooth in most lemurs. How did lemurs evolve differently? Contrary to popular belief, lemurs did not evolve from human ancestral primates. Instead, they share many characteristics and traits with basal primates, which split millions of years ago. While modern-day lemurs evolved from one branch, humans evolved from the other. Due to Madagascar’s remarkably diverse climate and varied topography, lemurs have adapted to the specific requirements of their particular environments, which is why there are over 100 different species. 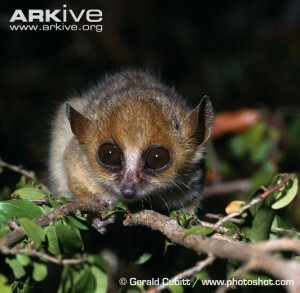 These species range from teeny tiny 1-ounce lemurs (Madame Berthe’s mouse lemur) to lemurs the size of a gorilla! Sadly, these giant gorilla-sized lemurs went extinct about 2,000 years ago, soon after humans arrived on Madagascar. For many decades we knew very little about these giant lemurs, but we have recently started being able to understand more about how these extinct animals lived (here is a good article about them). It’s true that lemurs are an incredibly diverse bunch, but in my opinion, one of the most remarkable species is the coquerel’s sifaka, the species to which Jovian belonged. 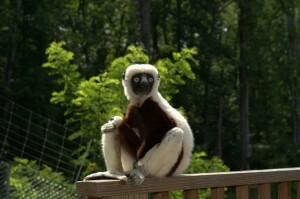 Jovian, who played Zaboomafoo, is a coquerel’s sifaka. Photo courtesy of the Duke Lemur Center. Coquerel’s sifakas are famous for their unique mode of transportation; if you’ve ever seen them or remember the show, you’ll know what I’m referring to. Unlike other lemur species, they primarily get around by leaping sideways along the ground or through the trees. When I was little, my big sister and I would pretend we were Zoboomafoo and jump around the backyard, imitating his sideways spring. Our mom stopped letting us leap in the house after we bashed into the art cabinet full of paints, knocked it down, and spilled the paints. No one was hurt, but the carpet was never the same. 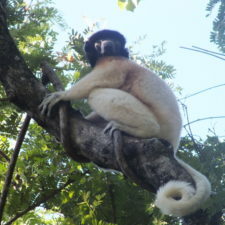 Baby coquerel’s sifakas are typically born in mid-summer, after about 162 days in the womb. They spend the subsequent three to four weeks clinging to their mothers’ bellies like a sloth, before beginning to ride on their mothers’ backs. By three months, their mothers get tired of chauffeuring them around, and they have to start getting around on their own. And at six months, the baby is expected to exclusively eat leaves and other solid foods—no more milk! Zoboo’s lemur relatives in Madagascar are endangered. Sadly, over 90% of all lemur species are threatened with extinction. 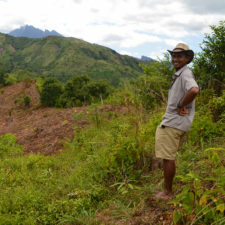 This is mostly due to the loss of their habitat from traditional slash-and-burn farming techniques used by rural communities, as well as hunting, climate change, and growing human populations in Madagascar. 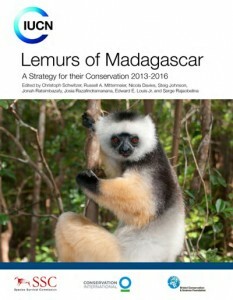 In 2013, an international group of 83 scientists from IUCN gathered together to create a 3-year plan to save the lemurs from extinction. Their plan—consisting of 185 pages—is divided into categories by threat level, and each category has its own budget. The entire plan will cost an estimated $7.6 million over three years, until 2016. Here’s a short article about the plan, and here’s the whole strategy. Here at the Lemur Conservation Network, we are not asking for your help so we can have houses with three rose gardens, six swimming pools, and two home spas. We are a purely volunteer-driven network that brings grassroots organizations to you, so you can donate, volunteer, and spread the word about these remarkable creatures on the brink of extinction. I got involved here because I want to help save the world in any way I can. 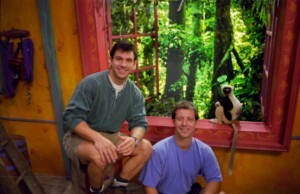 I hope this blog series will bring back some old memories of Zoboomafoo, and I hope you will learn something and be inspired to get active and save the lemurs. 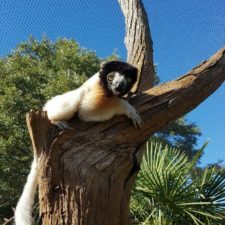 The next post will be about Zoboo’s species—the coquerel’s sifaka—in the wilds of Madagascar, and will include more information about the species and Madagascar, as well as more adorable lemur photos. I hope this series will make you smile, think, and remember Zoboomafoo, the lemur who leaped his way from the screen and into our hearts.